The High Performance Heaters for Machine Nozzles offered by us are manufactured with built-in thermocouple. A coil heater is mounted onto a Brass Collet which is designed and machined to high accuracy for better heat transfer and covered with a Chrome Nickle Steel clamping Band. Upon tightening the clamping Band, brass collet firms its grip over the nozzle, resulting in a very even fit for efficient performance. Coil Heaters, which are designed for use in hot-runner molds, when applied in such conditions works wonders. These heaters can be manufactured with built-in thermocouple, thus can be very accurately while processing sensitive materials such as Nylon 66 with 40% glass filled. High Performance Nozzle Heaters can be operated on higher temperatures of 400°C and is designed to provide for better & even heat transfer. Coming with built-in thermocouple support, these nozzle heaters provide for minimum material spillage possibilities and are perfect for processing of engineering plastics including nylon66, glass polyfill and others. Here, we ensure that the nozzle heaters are fabricated in compliance with defined industrial standards and made available in different finish sizes including 25 mm x 25 mm, 25 mm x 38 mm, 25 mm x 50 mm, 25 mm x 75 mm, 38 mm x 25 mm, 38 mm x 38 mm, 38 mm x 50 mm, 38 mm x 75 mm, 25 mm x 25 mm and 38 mm x 38 mm. PHP Mica Nozzle Heaters are designed and manufactured with more than 40 years of practical experience, for superior performance and life expectancy., As a manufacturer specialized in industrial electric heating elements & the desire to provide quality products and services to our customers both OEM’s & End Users, PHP specializes in designing Mica Nozzle Heaters, Ceramic Band Heaters, Mica Band Heaters, & Strip Heaters to your exact specifications. Depending upon applications PHP Nozzle Heaters are manufactured with high temperature oxidation metal sheath and high grade mica insulation resistant to moisture and high temperatures. A superior grade NiCr resistance wire is evenly wound to provide uniform and reliable heat distribution with the best combination of physical strength, high emissivity & good thermal conductivity to heat machine nozzles, good for sheath temperature up to 3000C. 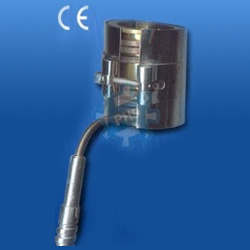 PHP Nozzle Heaters are also available with various construction styles with special inbuilt Energy saving options. Available in Premium, Economy & Power Saving Options Available. Conserves Energy with improved Heating Efficiency Upto 35 Watts/sq inch. Special High Grade Mica insulation for Superior Thermal Conductivity and die- electric strength. Min Dia available 25 mm. Min width available 25 mm.. Available in MS, Brass, Chrome Nickel Steel Sheathing. Expandable to fit around the Barral O.D. Easy installation & removal. Designed for Temperatures upto 300°C. Chrome Nickel Steel clamping with MS Inner Sleeve. Chrome Nickel Steel clamping with Chrome Nickel Steel inner Sleeve. 500 mm Glass Fibre insulated Metal Braided Cable. Chrome Nickel Steel clamping with Brass/Chrome Nickel Steel inner Sleeve. 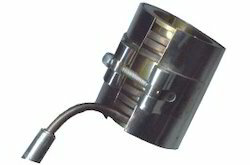 Barrel Nut type clamping with Terminal Protection Cap, unless specified. 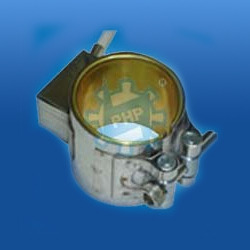 Single Phase: PHP's band heaters are usually designed on 230 Volts single phase unless specified. Dual Phase: Mica Nozzle Heaters can be designed with multiple circuits to operate in single or dual-phase circuits. A coil heater is mounted onto a Brass Collet which is designed and machined to high accuracy for better heat transfer and covered with a Chrome Nickel Steel clamping band. Upon tightening the clamping band, brass collet firms its grip over the nozzle, resulting in a very even fit for efficient performance. Coil Heaters, which are designed for use in hot-runner molds, when applied in such conditions works wonders. Compared to conventional method of heating machine nozzles with Mica Band Nozzle Heaters, PHP offers a High Performance Coiled Nozzle Heater which has many advantages. This product has evolved out of experience and regular heater failure complains of plastic processor around the globe. It has a very robust design and can perform efficiently even where polymer spillage is a regular feature. They can be manufactured with built-in thermocouple, thus can be controlled very accurately while processing sensitive materials e.g. Nylon 66 with 40% glass filled. Quick ramp up of temperature due to higher watt density. Negligible effect of material spillage. Efficient heat transfer due to inner Brass Collet. Accurate Temperature Control at the nozzle tip. Higher operating temperature (400°C max) compared to conventional Mica Band Heaters (250°C max). Looking for Nozzle Heater ?